We created these Easter Paper Plate Crafts as a sponsored craft for Oriental Trading. The full details and instructions for the project can be found on their idea’s website at Fun365.com. I’m constantly amazed at the ways you can transform a simple paper plate for crafting. 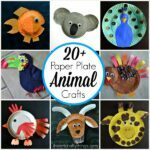 We’ve made our share of paper plate animals over the years, but another fun way to use paper plates for crafts is to make it a background for a simple puppet craft. 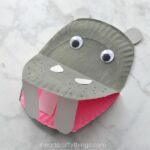 This Easter paper plate craft we are sharing today is super easy for kids to make and is so much fun for them to play with afterwards. 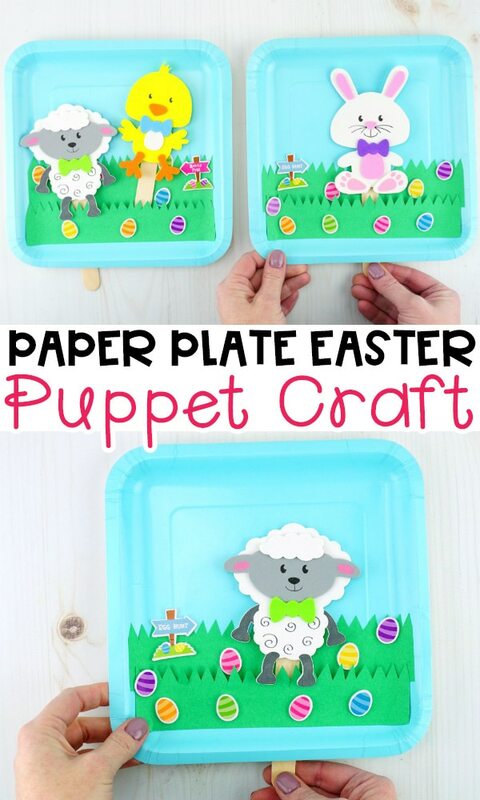 Oriental Trading helps make this paper plate Easter craft so easy for kids to make by using their Easter character craft kits as the puppets for our paper plate background. 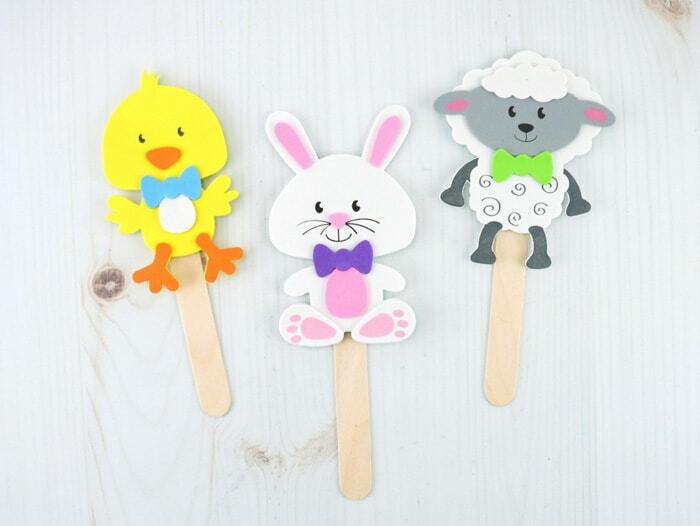 Children can choose between an adorable chick, Easter bunny or sheep for their puppet. Or they can make all three. I mean, why not?! The kits come in packs of 12 which makes this Easter craft perfect for play dates, preschool or class parties. Kids will love decorating their paper plate with construction paper grass, Easter eggs and other stickers. 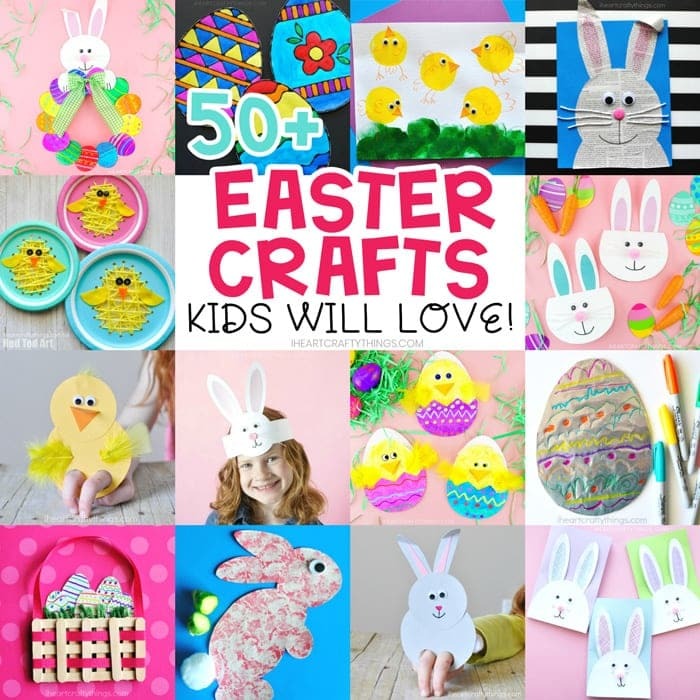 You can get all of these right at Oriental Trading which makes prep time for this Easter craft a breeze. After the paper plate Easter background is fully decorated and the puppets are made, it’s time for kids to play! Watch a short step-by-step video of us making and playing with this craft on our Facebook page. Insert the Easter puppet inside the slit of the paper plate. 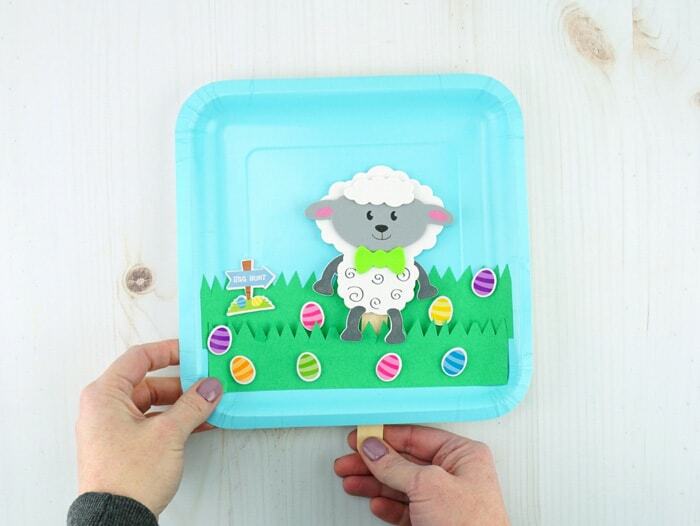 Hold the paper plate with one hand to keep it steady and use your other hand to move around the craft stick behind the paper plate to move your chick, sheep or bunny around the paper plate. 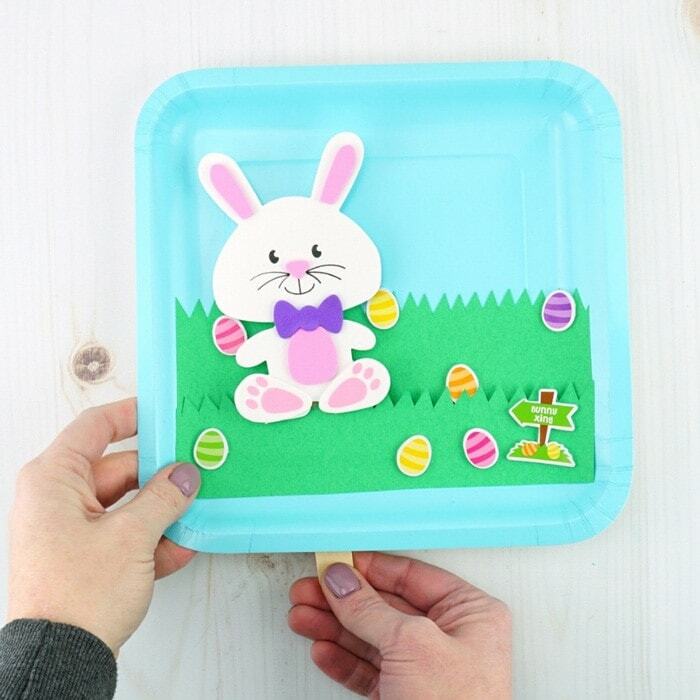 Head over to Fun365.com for the complete supply list and detailed instructions for how to make these cute Easter paper plate crafts. While you are there you can browse through their collection of other kids crafts and activities. 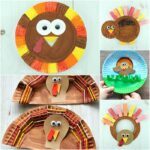 You’ll find more paper plate crafts and easy craft ideas using materials like construction paper and googly eyes. Did you know Oriental Trading is also your one-stop shop for making a great Easter basket? They have Easter baskets, bunny ears, colorful Easter eggs, fun Easter toys and gifts, a great candy selection and more. You can also find a huge variety of kids craft materials to stock up your supply at home or school. 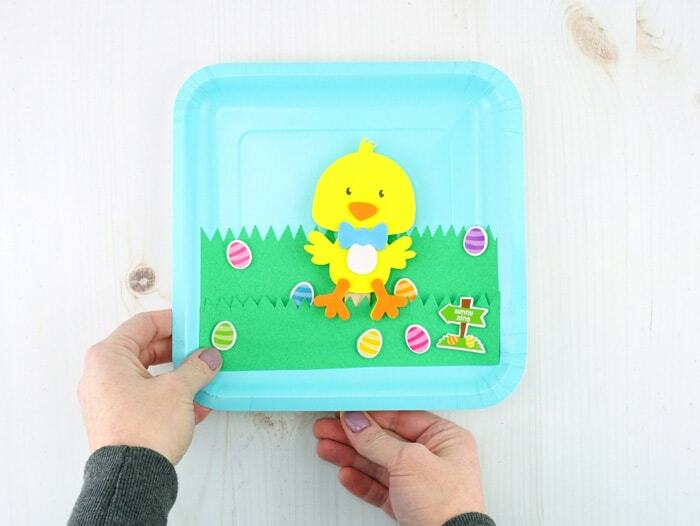 You might want to grab some colored paper plates to make more Easter crafts this year like a simple paper plate chick or paper plate bunnies. « Paper Plate Butterfly Craft -Creative and Easy craft for kids!